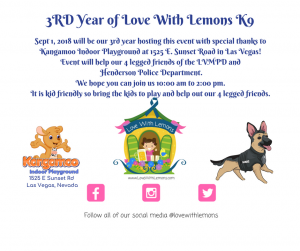 This will be the 3rd year for our K9 event for the LVMPD and Henderson Police Department doggies with special help from Kangamoo Indoor Playground! A family fun event for a special cause dear to Theresa Ann’s heart. Come on out, enjoy the lemonade and Kangamoo around! and let us know you’re coming and give it a share!